Mangilao, GU - On Thursday, March 1, 2018, 6:00-7:30 p.m., the Dean of the School of Business and Public Administration at the University of Guam will host a CHamoru-language panel from the Commission on Decolonization to discuss the status options for Guam/Guåhan: Statehood, Free Association, and Independence. 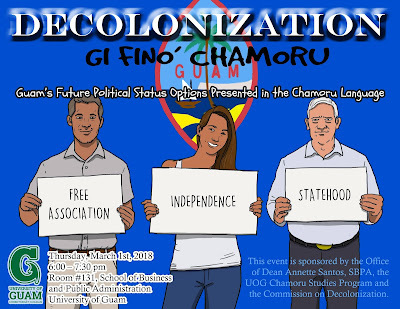 The event is called "Decolonization gi Fino' CHamoru" (in the CHamoru language).It will be held in Room 131.It is free and all are welcome and encouraged to attend. 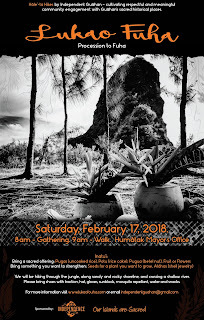 The panel, co-organized with Commission Director Amanda Blas from the Office of the Governor of Guam, will include special presentations gi Fino' CHamoru (in the indigenous CHamoru language) from representatives of the Taskforces on Statehood, Free Association, and Independence.Handouts and other educational materials in English will also be available. I have not written one of these posts in a while, although the collecting of Chamorro sayings continues. Fina'kuentos Chamorro is where I post different Chamorro sayings or phrases, they are important in providing us a sense of the Chamorro worldview, both in history and in a contemporary context, and give us a sense of the Chamorro particular flavor to life. Sometimes this flavor can be very familiar to other cultures, sometimes it can be very Catholic, sometimes is can appear to be very tied to the land and people here themselves. This saying "Si Yu'os, Yu'os. I taotao, taotao ha'" can be both very simple, yet also encompass very deep thoughts. It translates simply to "God is God, man is man." On the surface it is simply that men should not worry about things that are beyond their control, as those things lie in God's hands and he will determine what happens. It is a simplified serenity prayer. Ginen Fo’na na gaige ham guini gi tano’-ta Ma nå’i ham ni’ lina’la’-ta! Ti siguro yu' håyi tumuge' este, lao interesånte. Guaha meggai na hestoria put i Chamorro gi Islas Sangkattan gi este na ti gof anakko' na tinige'. Hu sodda' este na tinige' ginen i gasetan Saipan, annai manespipiha yu' infotmasion put Fino' Chamorro gi halom i kottre gi Islas Sangkattan. Ti meggai na infotmasion humuyong, lao hu fakcha'i este. Ti hu tungo' i kilisyanu na fulånu ni' tumuge', lao ya-hu i milalåk-ña i hinasso-ña siha. Frihon yan botlon. For many years, we were active participants in the death of our local vernacular. It started with the golden days in grammar school when speaking your language lands you some corporal punishment, a fine of five cents, scribbling several pages of “I will not speak Chamorro”; picking up trash outside the classroom after school, among others.